Posted: September 20th, 2013 under ApSIC Xbench. Shortly after the release for Xbench 3.0 of the Korean spell-checking dictionary a few days ago, we’ve added spell-checking support for 14 more languages based on Hunspell dictionaries. To check out these new dictionaries, in Xbench 3.0 go to Tools->Spell-Checking Dictionaries, choose the language and then click Install. Posted: September 9th, 2013 under ApSIC Xbench. We’ve added another video to our YouTube Channel on a very typical use case of Xbench: Using Xbench checklists to gather client feedback. You will see that the checklist feature in Xbench can be quite handy to help us ensure that we do not forget previous client feedback next time we receive a job from the same client. The video is found here. We hope you find it useful! We’re happy to announce that we have just published a Hunspell-based Korean spell-checking dictionary for Xbench 3.0. This is the first of a few more spell-checking dictionaries that we will be adding in the next coming days. 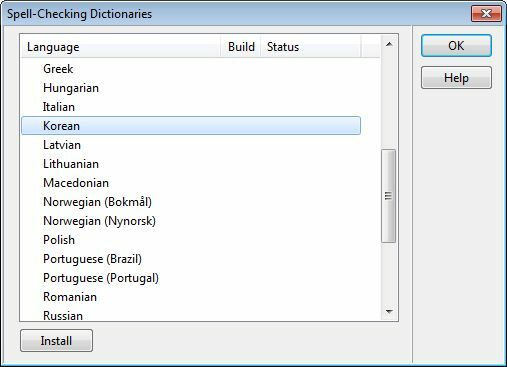 To install it, in Xbench 3.0 simply go to Tools->Spell-Checking Dictionaries, choose Korean in the list of the languages and then click Install. If you run into any issues when using this new dictionary, please let us know in our Support Page. Posted: September 5th, 2013 under ApSIC Xbench. We’ve posted a new video on YouTube that will show you how the spell-checking feature works in Xbench. Spell-checking in Xbench is a feature that can be very handy when you are unsure if you spell-checked each of the many small files in this project that you are about to deliver, or if you want to double-check that the translator you outsourced this job to did not forget to spell-check everything.